Your dorks, clockwise from the redhead: Kayleigh, Ken, Matt, Gilly, Igor, and Carson. "Hey, Marcia! Come and see the satanist! " Dork Tower is the name of a comic series by famed game creator, illustrator, and writer John Kovalic. Set in the fictional town of Mud Bay, Wisconsin, it focuses on the gaming adventures and personal lives of the four main characters, a group of geeks whose hobbies and interests include tabletop roleplaying games, video games, miniature games, collectible card games, science fiction and fantasy, comic books, computers, anime and manga — in short, anything and everything dorks (and Geeks, and Nerds, and Otaku) would enjoy. Gilly Woods, a perpetually perky goth girl. Confounding goth stereotypes, she likes cute and cheerful things, to the disgust of her brother Walden. Matt has a deep crush on her, but she has been hesitant to reciprocate due to his relationship with Kayleigh. She moved to London to attend graduate school, but later returned. 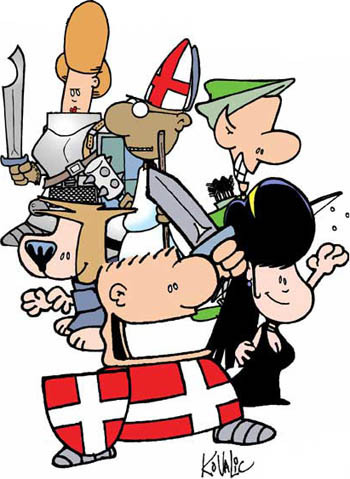 Dork Tower began as a four-panel comic in print format, published in various gaming-oriented periodicals such as Dragon Magazine and Pyramid. In 2000, it became a four-panel webcomic published approximately three times a week. Later, a monthly comic book was published by Dork Storm Press, and featured a mix of single-page strips, multi-page stories, and ongoing character development story arcs. The comic book had been on hiatus as of issue #36 due to personal affairs, but will resume publication in 2011 in annual mini-series releases. A series of TPB collections reprint the web and print strips. The strip has won several Origin Awards, and the comic has sold over 500,000 copies worldwide. All Anime Is Naughty Tentacles: At least the kind Igor and Carson watch . Ambiguous Syntax: Igor's gift of Muskrat Pie to Carson is understandably not well-received. Bait-and-Switch: When Gilly returns, she suddenly announces she's marrying someone in three days. The next few strips involve wedding preparations, in which she laments that the groom isn't getting more involved without actually saying who he is. Even in the strip where we get the words "Do you take this man to be your husband?" we see her holding someone's hand, but he's off panel. In the next strip, The Reveal is she's the one saying it; when she said she was marrying someone, she meant officiating at her brother's wedding to Phineas. Igor is such a fanboy that he was somehow able to watch Spider-Man five times — when it was only released six hours ago . Later, the players managed to summon up an Elder God... while playing Bunnies & Burrows. Big "NO! ": Audible five miles away. The gang's favorite game is "Warhamster". Later supplanted by ''Vampire: The Sparkling"
Boy Meets Girl: Subverted by Matt and Gilly. They're achingly perfect for each other — both gamers, both comic book fans, both cosplayers, both from the same town in Wisconsin. Too bad Matt keeps salvaging his relationship with his gamer-hating girlfriend and Gilly doesn't know he exists. Cannot Tell Fiction from Reality: Igor has reached a point where his memory can no longer distinguish between events that happened in real life and those that happened in games. Celeb Crush: Several over the years, most notably Matt with Sarah Michelle Geller and Carson with Megan Morrone. Another strip at a con had Matt running a game for the Knights of the Dinner Table. Cut-and-Paste Comic: Done occasionally, almost always with a self-deprecating joke about how Kovalic is being lazy. Cut Apart/Trick Dialogue: A frequent source of comedy. One story begins with Gilly and Matt preparing for a blind date. We then see them at a table talking, and seeing how they share lots of common interests and hobbies. The final panel shows that they are actually sitting at two different tables, each talking to someone else who think their hobbies are weird. Dead Artists Are Better: In one strip describing comic book convention tips, an artist has just drawn a sketch for a fan, who remarks "Wow, if you die on the way home, this'll be worth LOTS!" — With a mention that it's an actual convention quote. Discriminate and Switch: Happens to Gilly when she visits London, here . Don't You Like It? : To show how much he likes her, Ken gives Sujata a 1,000-point Korn Demon of Kaos High Priest of Pain Blood Champion miniature figure. Needless to say, she didn't take it well. Dungeonmaster's Girlfriend: Subverted with Kayleigh, who joined a session run by Igor to try to understand Matt's hobby. After some initial confusion, she became a rule-mastering power gamer, stomped all over the game's enemies, and reduced Igor to curling in wimpered submission. Referenced earlier when violating this resulted in a man's wife kicking him out of the house . Even Nerds Have Standards: After complaining to a girl that gamers are perceived as weirdos, Matt backs away in disgust when she admits she's a furry. Matt was beaten up by the Geeks in high school because he didn't know anything about video games past Frogger. Explaining the Soap: Played with when Carson asks Igor about Babylon 5 and gets an eight-panel wall of text about the conspiracies, universal issues, and civil wars and ancient chessmasters. When Carson comments that it's a lot for a single season, Igor corrects him — it all happened in the previous episode. Fake High: Matt's stoner brother thinks he is high after mistaking Matt's basing flock (artificial grass) for pot and smoking it. Fanservice: Not in the strip itself (thank goodness! ), but a regular subject of Take Thats. Friends Are Chosen, Family Aren't: Estella has fallen out with her family, who can't handle the fact that she's gay, but is pleasantly surprised when Gilly takes the fact in her stride. (She presumably doesn't know that Gilly's own brother is gay.) This leads to Gilly taking her home as a guest and adopted family member for Christmas — and her conclusion that "This is a time to be with with family! ... As long as we get to choose our family!" Fun with Acronyms: Played with when Igor starts Gamers For Personal Hygiene — acronym explained here. Headdesk: This is a recurring gag, where a sufficiently annoying situation will prompt any of the main characters to headdesk against the nearest table, wall, or fire hydrant. Demonstrated here . Home Sweet Home: Invoked by the corrupting influence of Sims. Hustling the Mark: After hearing that Igor has never played poker, Ken eagerly invites him to join his poker game. At first, Igor frustrates the other players with his naive questions and obvious tells, but by the end of the evening he makes off with all of the winnings. The final strip shows Igor talking to Carson on a cell phone about how he fooled everyone... while being pursued by a very angry Ken. Hypocritical Humor: Occurs fairly often, either as a Take That! against the characters' behaviors, or when they are Leaning on the Fourth Wall about Kovalic's writing or art. I Have No Son! : Invoked here , word-for-word. I Just Want to Be Loved: Despite Keyleigh's often abusive behavior, this is the main reason why Matt continues to date her. I'll Take Two Beers Too: Happens several times, usually after Matt has suffered yet another indignity with his gaming group or his personal life. One trip to a Ren Fair had him depressing a nearby bard into the same funk. I Need a Freaking Drink: Ken...didn't take the warped retelling of Gifts of the Magi at all well. Incredibly Lame Pun: Just look at Ken's expression. Matt and a minstrel at the Renaissance Faire use this trope as a Running Gag. And the aforementioned minstrel's drinking just before a gig reaches its logical conclusion . I Take Offence to That Last One: See Slap-Slap-Kiss below. I Want My Jet Pack: Referenced in this strip . Furry: Accept the cartoon fox fan! Include the cute cat girl! Embrace the strange sheep boy! Furry: All we are saying is, give fleece a chance! Leeroy Jenkins: Igor, showcased best here . Matt: Igor, do you remember Sir Billingsley? (Yes) You sealed his fate when he attacked an Orc garrison single-handedly, in his underwear! Igor: There wasn't time to put any armor on. Lethal Chef: One story featured an "Iron Chef Ramen Noodle" cook-off between Igor and Carson. Igor carefully crafts a concoction with tom-yum paste, rice wine, and fish sauce, while Carson's entry consisted of generic turkey dogs. Igor's dish is unbelievably aromatic, while Carson's prompted the question "This used to be organic?" from the judges. Carson wins anyway, despite Igor's entry being "like tasting clouds", because his entry reminds the judges of college dorm food — "The best years of our lives!" Igor also counts for his "Igor bars" (see Intoxication Ensues), as shown here , though that was probably on purpose. Not to mention "Cthulhu Alphabet For Kids" , "Lovecraft Is..." , and "Cthul Who" . Igor: "Told ya! Everything is better with Cthulhu!" Manchild: Arguably, all of the main characters could be counted as such. The Masochism Tango: Matt and Kayleigh, very much. Mistaken for Terrorist: Occurs in one strip with a "radical" "extremist" "black panther" named Huey. He's a white guy wearing a black panther furry costume. "Not Making This Up" Disclaimer: The author even screen-capped a news article about the Iraq War... that was running ads for travel to the war-torn country. Nutritional Nightmare: Igor Bars, which have been known to put those who consume them into sugar comas. There is an actual recipe for the bars, and it lists insulin as an optional ingredient (see here ). They once had a game based on The Lord of the Rings. The campaign opened with Merry killing and gutting Gandalf, Pippin beating Frodo to death... they were planning to institute a military draft in the Shire when Matt went catatonic. One strip had Matt crying to a friend about how his characters had not only derailed his adventure by killing everyone, they had also summoned Elder Gods to destroy the game universe. They had been playing Bunnies & Burrows — a game where all the characters are normal, mundane rabbits. Here. Paralysis by Analysis: Guest cartoonist Charlie Bates has Carson demonstrate the tabletop games version of the trope here. Perverse Sexual Lust: Igor's in love with three women — Apollo Smile, Lara Croft, and Daphne from Scooby-Doo. Print Long-Runners: First appeared in January 1997, and still going. Profiling: A non-police variation in an arc that starts out with Ken trying to order a cheeseburger . Fast Food Clerk: (pointing at Ken) SCARY BLACK PERSON! Rocks Fall, Everyone Dies: The group decides to follow a Demon Lord to Hell , despite many, many warnings from Matt. Rules Lawyer: In one of the Dragon strips, Ken is described as this by Matt and Igor, who are watching him have a freak out over the instructions on a microwaveable dinner because they are not as strictly defined as those in, say, a roleplaying game sourcebook would be. "Seinfeld" Is Unfunny: Referenced In-Universe when a pair of children are talking about how The Lord of the Rings was ripping off various sources. Shout-Out: To the "Four Men of Yorkshire" sketch here . Gilly's letter to Igor asks him to "say 'Hi' to the funny-looking kid with the big nose." Slap-Slap-Kiss: Happens periodically between Matt and Kayleigh. Small Name, Big Ego: Igor, whenever he boasts of using his gaming skills to overcome a problem or obstacle. Also being an overeager fanboy . Occasionally used in a Take That! against self-proclaimed Moral Guardians and other bureaucrats, as demonstrated here .
" We're Still Relevant, Dammit!!" Super-Stoic Shopkeeper: Bill tries to be like this,with varying degrees of success. Take That, Audience! : Always done good-naturedly, but Kovalic has an insider's knowledge of his geeky audience's foibles. Thicker Than Water: Igor recommends ignoring it and allowing yourself to unfollow and unfriend relatives. This Loser Is You: While Kovalic's characters are rarely complete losers, the likes of the semi-competent munchkin Igor, neurotic geek Matt, and ill-fated small furry animal Carson may be subjects for rather wry audience identification. Token Nonhuman: Carson the muskrat, naturally. Too Dumb to Live: Many of Matt's gaming sessions end with all the (game) characters dying due to this trope. One adventure ended with their characters chasing a Demon Lord to Hell and getting instantly destroyed ... which they insisted must be an illusion. Matt: Fireball Spell? What do you think that's going to do in Hell? Too Spicy for Yog-Sothoth/Your Brain Won't Be Much of a Meal: In this strip, Igor engages a mind flayer with purple nurples and "the dreaded doom wedgie". Since this effectively proved his character didn't have a brain to flay, he actually won. TV Tropes Will Ruin Your Life: Demonstrated here. Winged Soul Flies Off at Death: Red Bull gives you wings! Wrong Genre Savvy: After playing a Call of Cthulhu campaign, Matt's players were unable to adjust to the setting of Pendragon and their characters kept behaving as though they were about to face Lovecraftian horrors.